If you’re a Tom Waits fan who discovered the man’s work on any album from The Heart of Saturday Night onwards, chances are you don’t think much of Closing Time, Tom’s 1973 debut. Where’s the burlesque beat poetry? Where’s the grotesque carnival barker? Where’s the junkyard orchestra? Dammit, where’s the jazz? The extent to which Closing Time represents the album Waits wanted to make remains debated. Producer Jerry Yester (alumnus of the New Christy Minstrels, the Modern Folk Quartet and the Lovin’ Spoonful, producer of Goodbye and Hello and Happy Sad) maintains that Waits got what he wanted and that it was not his job to impose a sound on the artist; Barney Hoskyns wrote in his Waits book that Yester’s vision of a fairly conventional acoustic singer-songwriter record was at odds with Waits’ desire for something jazzier and looser. The striking change from Closing Time to Saturday Night, achieved in just a year, suggests that Yester’s memories aren’t wholly accurate, but he wouldn’t be the first producer who’s been disingenuous about the extent to which he shaped a record. Yet there are elements of Closing Time that are predictive of Waits’ later work. The muted trumpet on Midnight Lullaby, Little Trip to Heaven and Closing Time (the song); the chord structures (in the 1970s Tom Waits never met a ii-V-I he didn’t like); the general after-hours vibe; all of these point towards his early classic run of Saturday Night, Nighthawks at the Diner and Small Change. As does one song above any other on Closing Time. No, it’s not Martha (I find Martha a little overpraised – the problem of a song that’s one side of a conversation is that the singer has to tell and can’t ever show, which only draws attention to the artifice of the device, as well as forcing lines into the singer’s mouth that would never be said in a real conversation). For me, the real classic Waits song on this record is Grapefruit Moon. It’s the first song that really feels like a proper Tom Waits ballad, with the strings, the double bass and the sozzled sentimentality to prove it (and of course that ubiquitous ii-V-I turnaround). The tune feels like a Waits tune – ‘authentic’ is a problematic word to use in the context of Waits and his career so I won’t got that far. Let’s just say that he’s playing to his strengths with this song. He sounds more comfortable here than elsewhere. The lyric’s a little too gauche and the vocal a little too unsure and unsteady to really qualify it as an out-and-out classic Waits ballad, but it’s reason enough that fans who may be put off Closing Time by the general Asylum-ness of Ol’ 55 and I Hope That I Don’t Fall in Love With You should hear it. And it’d be a boring world if artists always got it right first time. We wouldn’t be able to go on a journey with them. 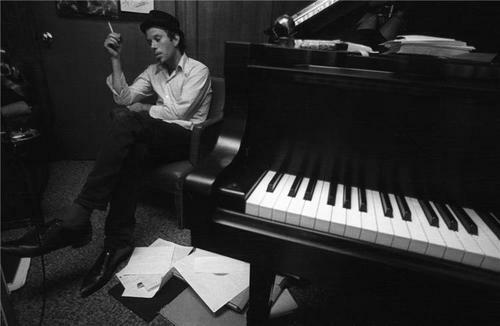 Tom Waits, with cigarette and piano. Whiskey presumably somewhere nearby. This entry was posted in Music and tagged Asylum Records, Closing Time, Grapefruit Moon, Heart of Saturday Night, Jerry Yester, Small Change, Tom Waits on June 15, 2013 by rossjpalmer.